The Rig comes with a main control, it moves everything at once, on the X, Y and Z axis. To use it, just Right-click the big circle on the bottom and press G on your keyboard to move. 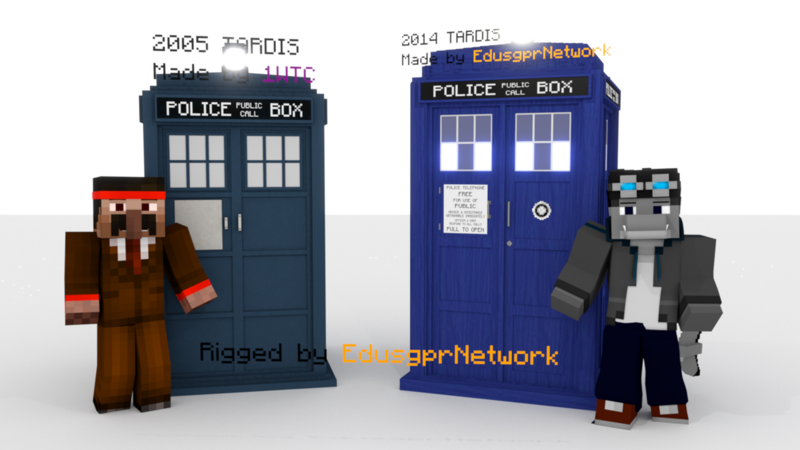 The Rig also comes with a rotation control, it rotates the TARDIS. To use it, just Right-click the plain axes at the top and press R on your keyboard to rotate, press R twice to go in a better rotation mode. The Doors are fairly simple to open, just Right-click the Bones at the Doors and press R on your keyboard to rotate. First of all, you'll have to separate your screen. To do that, you'll have to Left-Click, hold and slide to the left the separator on the upper-right corner of the viewport. This was explained how on the -Demat/Remat Topic. All you need to do now is move the time cursor along the timeline and move the Dalek too and you will have an animation! I only have became the 2005 version is that normal? Is it possible to get this is a model file compatible with Mine-imator? Do I have to buy the 2014 version? if I already bought the rig before it was released? Can the TARDIS exteriors of other Doctors be bought?